In this class, students will be working with their own designs or with predefined designs. All supplies are provided and students are able to take the embroidery pack home. Feel free to bring a t-shirt, a jean jacket or anything you want to embroider. If you don't want to make an embellishment on your clothes, the host will provide lot of fabrics samples. If you want to bring your own fabric, the best choice for beginners is cotton fabric. If you already know a little bit about embroidery, you can also learn new stitches or work on new designs. I am Elise, a French artist living in DC for more than two years. I am a seamstress and an embroidery artist. 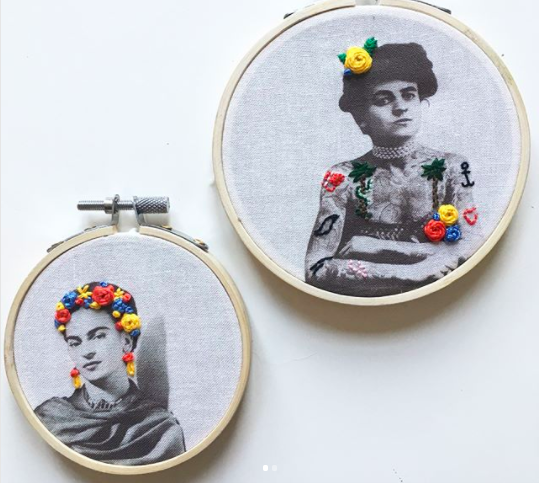 My work concentrates on historic women who inspired me, and women's rights. With my embroideries, I try to show in the most poetical and political way the beauty and the force of women. The Comptoir was born when I became an immigrant, the Comptoir means the counter, it's the place to meet and to learn from new people.